When inside PAW, and you try to expand a node of a TM1 instance, you get a error message. Session can not be established for server proven_techniques 500 (internal server error) “code” “explorer” “refID” “message” .”Failed to get children for server cubes”. “cause”.”java.net.NoRouteToHostException: No route to host”. In one case this is because of DNS and routing problems in network. The PAW server and PA server have both two network cards, and can only communication on one of them. You must in TM1S.CFG tell Tm1 instance what network card it should use. in TM1S.CFG and restart the TM1 instance. Replace the ip number with the correct ip address of your Planning Analytics server. Important that the IP address are inside ” double quotation mark. When user surf to the PAW, they are not administrator and can not add other users. Click on the user — and see there is not a option for Administration. This is a new PAW setup with CAM authentications. The first users that you add in a TM1 instance as ADMIN will be admin in paw when you login to paw. 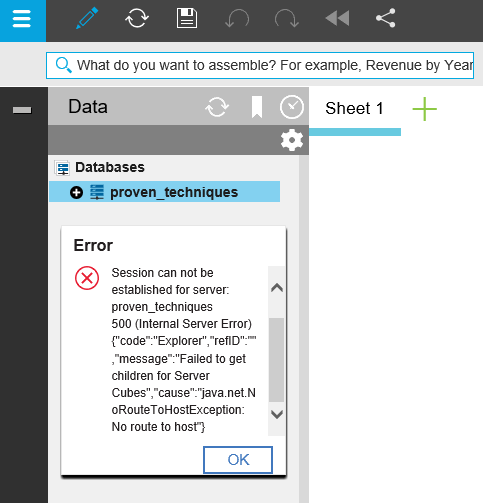 Therefor you must add CAM users to a native TM1 instance first. Open up a Tm1 application in Native mode. Like Proven_Techniques. (This TM1 instance you point out with the HTTPport number is the instance that will define the first ADMIN in paw, even if you use security mode 5). Start TM1 Architect and login to Proven_Techniques as Admin. Go to Security – Client/Groups. From menu Clients select Add New Client. Add your CAM user from your AD domain, that you want to be ADMIN in paw. Mark the user to be ADMIN in TM1 Architect. Click OK.
Now TM1 instance is using CAM authentication. Click on status tab – wait until CPU usage is below 1%. Login as the CAM user you have given ADMIN rights in Proven_Techniques. This user should now have a ADMINISTRATOR option under its name. The list will only show name for people who have already try to login.